There is little doubt that the Huawei Mate 8 is on the company's roadmap, the only question is when exactly it is going to arrive and, even more-interestingly, how it will look. Previous leaks have indicated that the former might occur in September at the IFA, just like its predecessor. As for the exterior, we have already seen a glimpse of what was said to be an early unit, but that was quite some time ago and now a new render sheds a little more light. 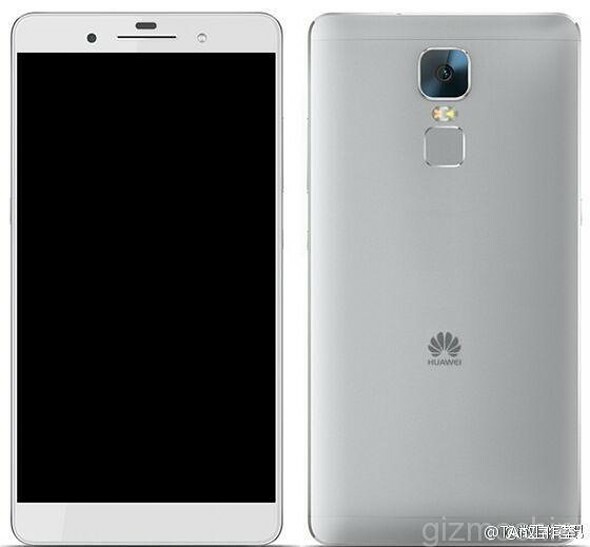 The picture in question allegedly portrays the successor of the Huawei Ascend Mate7 complete with a new metal rim all around as well as a few other apparent changes. Most notably, there is the weird sensor above the earpiece on the front of the unit. It is obviously not the camera, which can be seen to the left and doesn't look like a flash - however, the dot right of the earpiece might be. This leaves us wondering what could be hiding underneath. Perhaps it is simply a proximity and light sensor, but it could be something more-advanced. As already mentioned, the previous set of photos we have, show quite a different setup. Perhaps, the design has evolved since then as we can also spot that the front flash is absent on the older leaks and the speaker placement is different from what we see now. As far as specs go, we expect the Huawei Mate 8 to come with a large 6-inch QHD display, 3GB of RAM and a 20MP main camera. Initially, the Kirin 930 SoC was listed in the specs, but plans might have changed and we could see the brand new beastly Kirin 950 with its four Cortex-A53 and four Cortex-A72 cores, complete with the Mali-T880 GPU.